Virginia Rep’s Old-School Classic “A Raisin in the Sun” Still Rings True | Theater | Style Weekly - Richmond, VA local news, arts, and events. Aaron Sutten Actors Matthias Williams, Katrinah Carol Lewis, Jasmine Eileen Coles, Jerold Solomon and the seated Trezana Beverley star as a black, working-class Chicago family in 1959. For much of the last century, restrictive covenants in deeds forbade white people to sell their houses to black people. Mortgages were denied to those who sought to live in the neighborhoods of the other, and redlining made it difficult for African-Americans to invest in their own neighborhoods. And even if you were able to move into the community of the other, your new neighbors might not welcome you. The latter is certainly a factor in "A Raisin in the Sun," Lorraine Hansberry's 1959 play about a working-class black family in South Side, Chicago. Issues of race, class and the American dream are all at work in this hefty drama, which never loses focus on the family at its center. 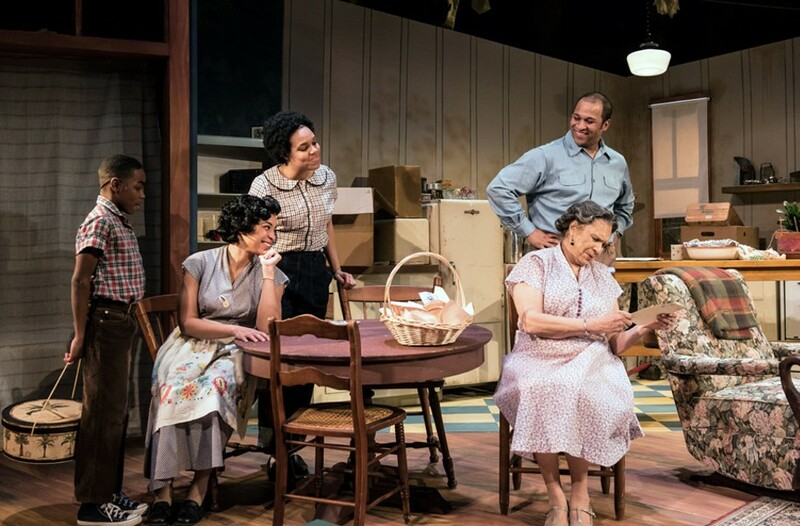 Presented by Virginia Repertory Theatre under Tawyna Pettiford-Wates assured direction, "Raisin" is in fighting form six decades since its debut. Crammed together in a tiny apartment with a $10,000 insurance check on the way, three generations of the Younger family harbor dreams about what their future will hold. As in many a family, Mama rules the roost and has held that position since she and her late husband left the South during the Great Migration. Portrayed by Tony-winner Trezana Beverley — a first for Virginia Rep — Mama is a formidable presence, whether assaulting a family member or crying out in anguish. Beverley gives a nuanced, forceful portrayal as a woman who has been through much but refuses to give up hope of a slightly better tomorrow. As Walter Lee and Ruth – Mama's son and daughter-in-law — Jerold E. Solomon and Katrinah Carol Lewis do good work as a put-upon couple at the center of the action, particularly in the climax of the second act. Tired of not getting anywhere in life, Walter Lee has dreams of opening a liquor store, while Ruth, like Mama, hopes to own a home. But some of the show's best scenes belong to Jasmine Eileen Coles, who plays Walter Lee's studious sister Beneatha. Coles lights up the stage, especially during her flirtatious moments with Bru Ajueyitsi, who portrays the charismatic African student Joseph Asagai. Eschewing a simple rundown apartment, Katherine Field's set design includes a raked stage and lifted ceiling to show the telephone poles and cityscape of the outside world. The angles emphasize the claustrophobia of the space while hinting that the dilemmas faced by the Youngers extend to the outside world. Lynne Hartman's lighting design accentuates the mood of each scene and is particularly effective during the show's tableau moments. And the sound design by Derek Dumais gets all the little details — including the sound of an upstairs vacuum cleaner — just right. With "Raisin," Pettiford-Wates has delivered an old-style drama that slowly builds to a climax. Its issues of fighting inequity and the need for familial love still ring true today, and Pettiford-Wates' highlighting of the play's humor helps its nearly three-hour run time fly by. Touching on social issues while still providing a loving portrayal of a hardworking family, Hansberry's play remains a classic. Virginia Repertory Theatre's "A Raisin in the Sun" plays through March 11 at the November Theatre, 114 W. Broad St. For information, visit va-rep.org or call 282-2620.